The name Nara Thai Cuisine might sound familiar to those that travel to Bangkok on regular basis. Listed in Thailand Tatler's Best Restaurants List from 2007 to 2014, this restaurant is a name to be reckon with. 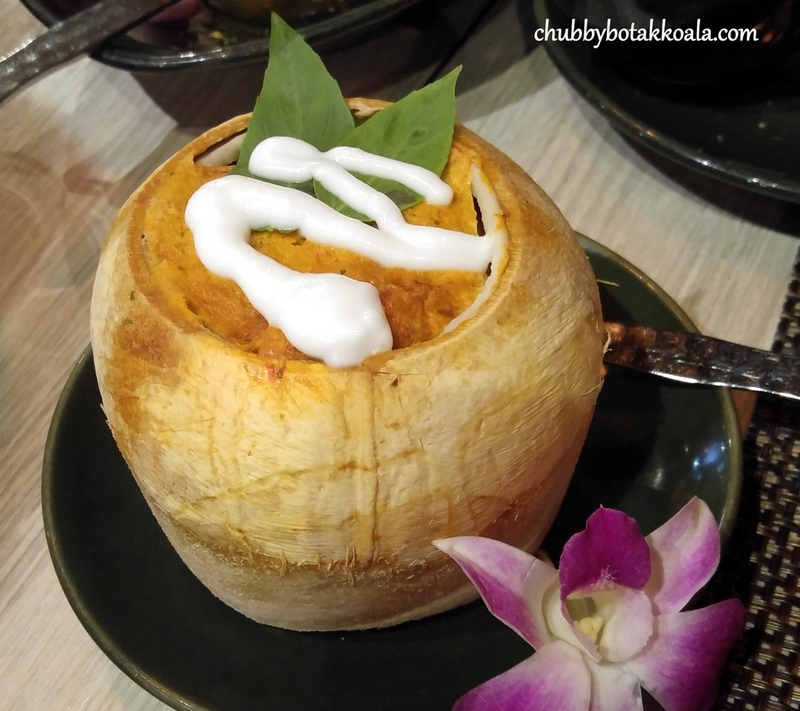 We personally dined in Bangkok Nara Thai in Central World last year, so we have an idea on what they offered in Nara Thai Cuisine. Nara Thai Cuisine Singapore ('NTS') opened its first outlet in Ion Orchard in September 2013. Singapore Tatler's recognise Nara Thai in its Best Restaurant List in 2014. Banking on its current popularity, Nara Thai has open its second outlet in Singapore at Westgate Shopping Centre. Drawing inspirations from the Bangkok winding alleys and streets (Bangkok's Sois), NTS will showcase 14 new dishes of the hidden gems that being kept secret by Bangkokians. We started with Mushroom Salad (Yum Hed - $14.90). Combination of thinly sliced oyster mushrooms and brown clamshell mushrooms, dressed garlic chilli dressing. Resulting in very spicy dish that will wake up your appetite. Definitely too spicy for me, but LD has no problem with it. North-Eastern Spicy Mince Pork (Larb Moo - $13.90), Thai answer to meat wrapped in lettuce that commonly found in Korean Dishes. The aromatic stir-fried pork, packs a manageable heat. The crunchy mini butter lettuce leaves act as a mini bowl for this appetizer and also to balance the dish. Stir-fried soft shell crab with Basil sauce (Phad Kra Pao Phunim - $16.90). A good combination between traditional sauce with modern ingredients. The soft shell crabs was crispy and juicy, crab meat complements the aromatic basil sauce. Fried Whole Sea Bass with Basil Sauce ($32.90). 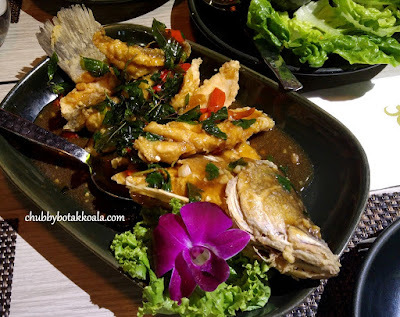 When it comes to fried fish, the Thais are one of the best around. This fried fish is crispy on the exterior while still moist and flaky internally. Best part of course is the tail and fins. The basil sauce provided a different alternative to the normal chilli sauce in the fried fish. Fried Century Egg with Chili and Hot Basil Pork ($15.90). This version of the mince pork kind of ordinary. After a few dishes containing basil, the basil infused dishes just become too repetitive. Although the century egg is added in this dish, it was almost had no effect as the spiciness can blow your mind, for those who love spicy food, this might be a dish for you. Stir-fried Tom Yum Tiger Prawns (Kung Phad Num Prik Pao Tom Yum - $28.90). Nicely fried aromatic tiger prawn, accompanied with tom yum sauce. The skin of the prawn is crispy, while the flesh is crunchy and springy at the same time. A toned down version of the spicy tom yum, which definitely a plus point from me and more acceptable to everyone palate. The best dish on the night is the Seafood and Coconut Otah ($16.90). The coconut rich and creamy otah steamed inside the coconut husk. The filling is light, fully and packs of seafood and fish bits that I enjoyed with the rice. A must order dish. Blue Jasmine Rice (Kao An Chan - $2) is the rice used to accompany our dishes. A lightly more aromatic compare to the regular Jasmine rice, with a more crunchy texture in it. 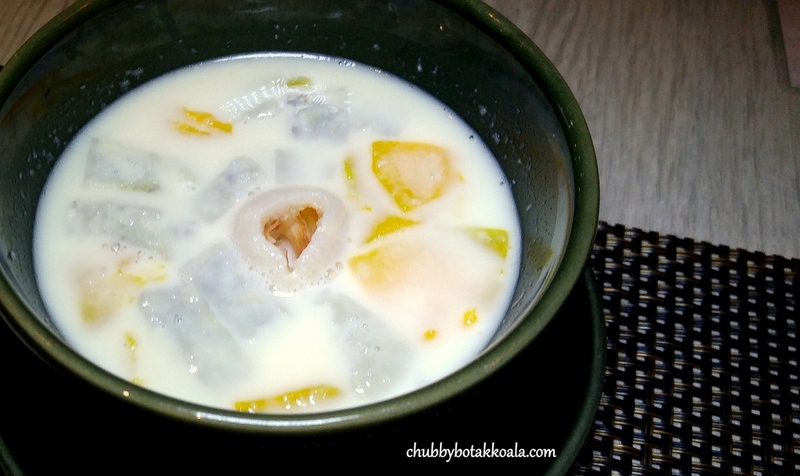 To put out the spiciness while dining here, the Thai Iced Milk Tea is a must try. Desserts are Black Glutinous Rice with Coconut Milk (Kao Neaw Dum Piek - $6.90) and Yam & Pumpkin in Lychee Coconut Cream (Khrim Maphraw Linci Khnom - $7.90). 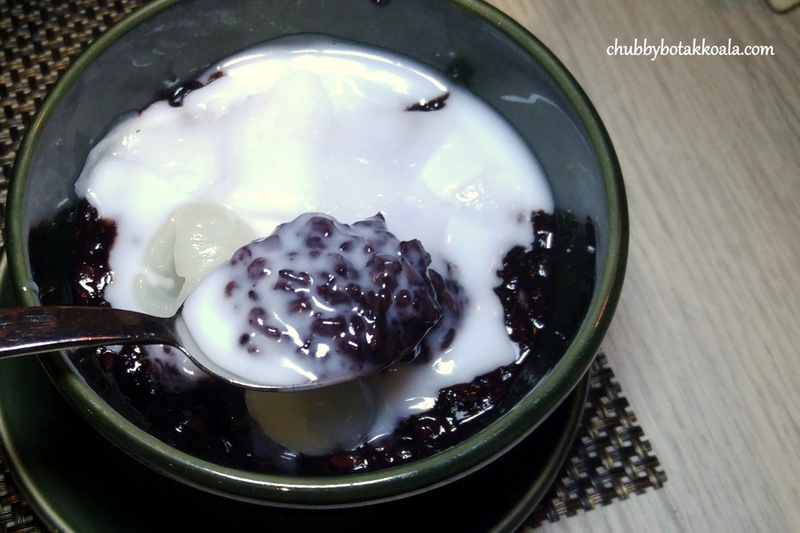 Black glutinous rice dessert has a crunchy al-dente texture. Though the coconut milk is thick and creamy, it does not have an overwhelming sweetness to it. Surprisingly a couple of longan, actually balance the desserts well. Meanwhile, this Thai version of “bo bo cha cha” is a delicate dessert on its own. The cubed yam provide the crunchy texture, while the pumpkin add the subtle sweetness with a soft texture. The diluted coconut cream made it light and enjoyable to slurp. The lychee add a mini surge of sweetness to this dish. A must try dessert indeed. Decor of Nara Thai is Modern, chic with heavy Thai influenced. The dim lighting exudes a intimate dining experience for a premium Thai restaurant. The verdict, although Nara Thai Cuisine Singapore is the franchise from the Nara Thai in Bangkok, the restaurant here is “same same but different”. It has an identity on its own, as some of the dishes were tuned to adjust to the local flavours. Overall, Nara Thai Cuisine is still a good Thai Restaurant and you should give it a try . Cheers!! Looking very nice. I love those pictures.